You probably will remember Nintendo’s Game and Watch LCD games if you grew up in the 1980s. These primitive portable games were the great-grandparents of the Game Boy, GBA, and DS, and now they’re back for you to enjoy once again. 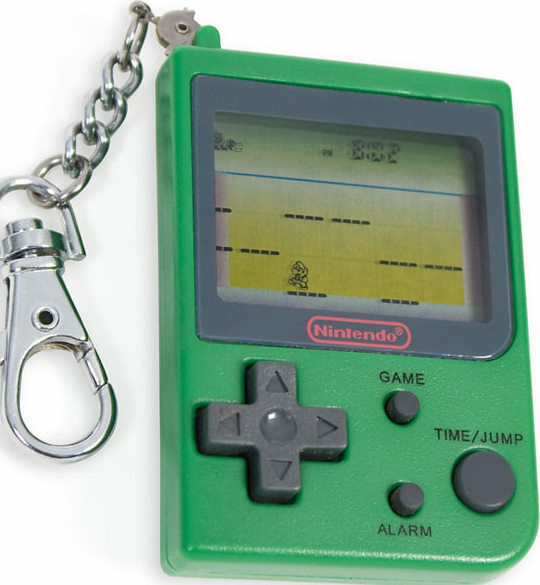 These Nintendo mini classic games have gotten a modern makeover, with all of the electronics fitting neatly into a keychain-sized gadget. Each one hearkens back to a classic Game & Watch title. There’s Super Mario Bros., Donkey Kong Jr., and Mario’s Cement Factory, among others. All of them feature the same rudimentary LCD animations found on their ancestors, along with simplistic color overlays. Each of the Nintendo Mini Classics is available over at Firebox for £9.99 (appx. $16 USD). But if you’re willing to dig around a bit over on Amazon, you can find some of these for as little as $2.99! This entry was posted on Sunday, August 2nd, 2009 at 9:44 pm	and is filed under Funny Junk. You can leave a response, or trackback from your own site.